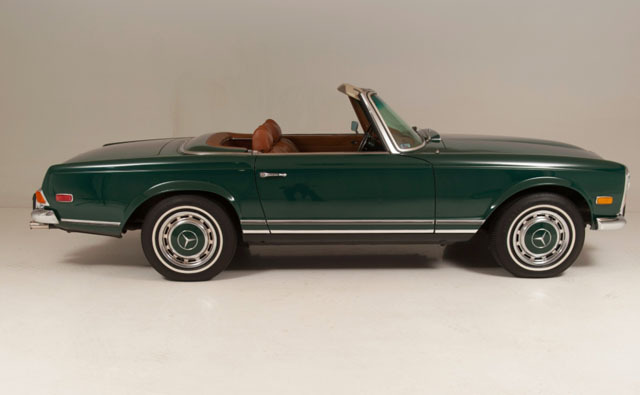 Mercedes 280SL Roadster. 2 Door.This matching numbers , original, unrestored car comes equipped with a 6-cyl. 2778cc/180hp motor and 4-speed automatic transmission. 77,000 original miles. This car features the original paint, metal, and factory air conditioning, an incredibly rare option. It has no rust or accidents. The engine is original and has all of its original air conditioning components. The engine compartment is tidy and the interior is in incredible original condition. The seats are firm and comfortable, the car has all of its original wood, which is absolutely beautiful. Overall, the car is 100% all-original with no modifications. Other features include hardtop and soft-top, both in excellent condition. Original wheels and hubcaps. The car comes with its original manuals. For further information regarding this vehicle, please call (617) 680-9308.